This is the seventh year that I’ve been picking favorite Christmas movies and it’s getting harder to feature movies that haven’t already been covered in previous years’ blog posts. This year’s group isn’t exclusively Christmas-centered, but all have important scenes set during the holiday season. Enjoy the holiday season and enjoy watching these classic movies! 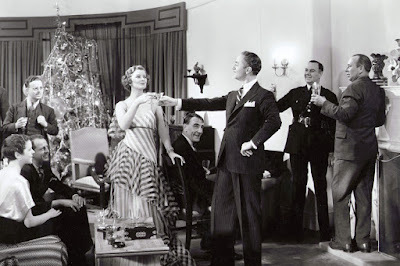 The Thin Man—1934 The first of the famous film series, featuring Nick Charles (William Powell), a retired detective, and his wife Nora (Myrna Loy) who decide to spend the Christmas holidays in New York (they’re based in San Francisco). When the daughter of a former client, Dorothy Wynant (Maureen O’Sullivan) asks Nick to help her find her father, Gilbert Wynant (William Henry), who has gone missing. Even though the evidence seems to suggest that Dorothy’s missing father is guilty of murder, his daughter refuses to believe that he could murder anyone. When Nick discovers that Gilbert himself has been murdered, suspicions turn elsewhere. The true murderer is discovered during a famous dinner party scene, but my favorite scene is the Christmas party that Nick and Nora throw for Nicks’ old friends—a collection of misfits—many of whom he sent up the river as a detective. At the party, Nora says, “Waiter, will you serve the nuts? I mean, will you serve the guests the nuts?” This has to be one of my favorite movie lines of all time. 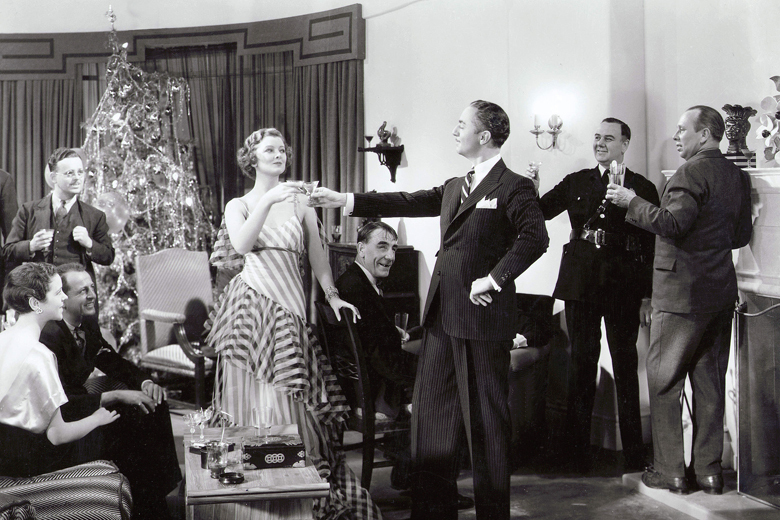 Myrna Loy and William Powell toast each other at Christmas. Backstory: The movie was shot in 12 days by director W. S. (One-Take Woody) Van Dyke on a shoestring budget. The film went on to become a huge box office hit that spawned five sequels. 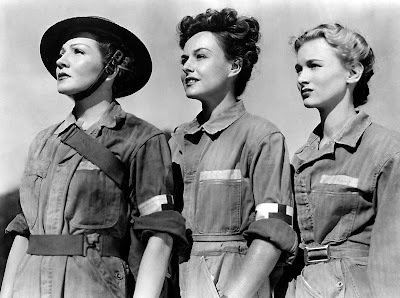 So Proudly We Hail!—1943 This classic stars the three queens of Paramount: Claudette Colbert, Paulette Goddard, and Veronica Lake as military nurses sent to the Philippines during World War II. After the bombing of Pear Harbor, the lives of the military nurses will never be the same. Onboard a ship during Christmas Eve, the nurses and the rest of the military crew celebrate the holiday. The chaplain (Walter Abel) encourages everyone to have faith, not a mindless faith, but a faith in each other and “our beliefs.” It’s an interesting counterpoint to the uncertainty of war, especially during the time this film was made and released. It’s hard to imagine what audiences in 1943 were feeling as they watched this film and the events depicted were unfolding in real time. army nurses in So Proudly We Hail. Backstory: Veronica Lake changed her trademark “peek-a-boo” hairstyle to keep with Army regulations in real life. She let her hair down for her final scene. Paulette Goddard was nominated for Best Supporting Actress, losing to Katina Paxinou in For Whom the Bell Tolls. A Tree Grows in Brooklyn—1945 Based on the best-selling novel by Betty Smith, the drama tells the tale of an impoverished family living in the Williamsburg section of Brooklyn. It’s a coming-of-age story about Francie Nolan (Peggy Ann Garner) who loves reading and school. With a mother (Dorothy McGuire) who washes floors and collects rags to earn money to support her family and an alcoholic mostly out-of-work father, life for the Nolan’s seems pretty bleak. In spite of his irresponsible behavior, Johnny Nolan (James Dunn) is idolized by Francie. Johnny is gentle and indulgent where her mother, Katie, tends to be stern and strict. Because the family is so poor, they can’t afford to buy a tree for Christmas. 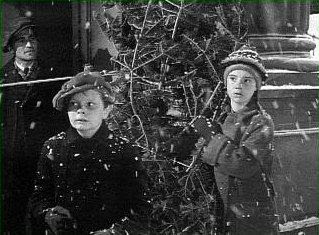 On Christmas Eve, Francie and her brother Neely (Ted Donaldson) get a free tree by catching one that the tree salesman throws their way when he no longer call sell them. The Nolan’s celebrate a happy Christmas with Katie’s sister Sissy (Joan Blondell) and her husband (John Alexander). they caught on Christmas Eve. Backstory: James Dunn won the 1945 Academy Award for Best Supporting Actor for his portrayal of the tragic Johnny Nolan. Peggy Ann Garner won the 1945 Academy Juvenile Award for her portrayal of Francie Nolan. A Tree Grow in Brooklyn also marked the movie directorial debut of Elia Kazan. Lady in the Lake—1947 This iconic film noir takes place during Christmastime. In fact the opening credits feature Christmas Carols and a set of Christmas cards, which hide a gun underneath. Robert Montgomery stars as detective Philip Marlowe who is hired by a publishing executive Adrienne Fromsett (Audrey Totter, who is awesome, by the way) to locate the wife of her boss, Derace Kingsby (Leon Ames). The film is shot from Marlowe’s point of view, which means we only see Marlowe’s reflection in a mirror or when he is directly speaking to the audience, since in true noir fashion, the movie is told in flashback. Everywhere you turn, there’s a Christmas wreath, tree, or other decoration. There’s even an office Christmas party at the publisher Kingsby owns and where Adrienne works as editor. As Marlowe gets closer to the truth, dirty Detective DeGarmot (Lloyd Nolan) runs him off the road. Having just enough energy, Marlowe calls Adrienne for help. She takes Marlowe to her apartment and declares her love for him; they spend Christmas Day together. After the usual noir twists and turns, the major plot points are revealed and Marlowe and Adrienne go to New York City to start their life together. Backstory: this was Robert Montgomery’s first film as a director and his last for Metro-Goldwyn-Mayer, where he had been under contract since 1929. Montgomery completed the movie nineteen days ahead of schedule, helping to make it a box office winner for the studio. If you want to check out the Christmas favorites from past years, please click on the links below.